"Ayesha Dean is a heroine for our time..." - KAMRAN PASHA, author of Mother of the Believers and Shadow of the Swords. ​New Friends, New Adventure, New Mystery! Ayesha, Sara & Jess are back in an exciting new adventure, and this time they’re off to Spain! When a fellow passenger’s beloved grandpa strangely disappears, Ayesha and her friends gladly join in the search for the missing person. But as Ayesha delves further into the mystery, the more sinister the stakes become! Ayesha finds a link between the missing person and a 17th century diary that contains clues to an ancient mystery. However, each step closer to discovery seems to pose greater chances of peril. Can Ayesha uncover the truth without putting herself and her friends in mortal danger? "Ayesha is a clever and enchanting sleuth solving a new mystery against a fascinating historical backdrop." - AUSMA ZEHANAT KHAN, award-winning author of The Unquiet Dead and other books in the Khattak/Getty Mystery Series and The Khorasan Archives fantasy series. ​﻿﻿﻿​﻿THE ISTANBUL INTRIGUE - Ayesha and her friends Sara and Jess jump at the chance of accompanying Ayesha's uncle on a trip from Australia to Istanbul. But when Ayesha discovers a mysterious note as a result of visiting an old bookshop, their relaxing holiday starts to get a whole lot more complicated! Ayesha finds herself trying to uncover a hundred-year-old Ibn Arabi mystery, while trying to avoid creepy villains, and still making sure that she gets to eat the best doner kebab Istanbul has to offer. 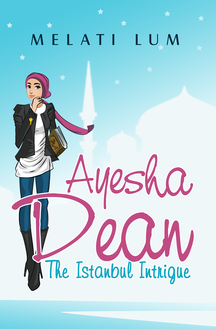 It's all in a day's sleuthing when you're Ayesha Dean. Lucky she can count on her best friends to always have her back!